As Novak Djokovic climbed from a distant No. 3 to a convincing No. 1 in men's tennis over the past few years, he gave a lot of credit to a new gluten-free diet. He was also famously outed by this newspaper during the 2011 U.S. Open for his devotion to the benefits of sitting inside a pressurized egg-shaped contraption called a CVAC. But in a new book that will be released next month, Djokovic reveals much more about the diet and regimen he follows—details he has, until now, kept quiet. It offers a rare look into the mind of an elite athlete who has climbed to the top of a brutally competitive sport during one of its most competitive eras. It also confirms something many tennis fans have long suspected: Novak Djokovic is a decidedly unusual fellow. Want to roll like the world's top men's tennis player? Start by drinking loads of warm water all day long, as well as shakes made with pea protein concentrate. Avoid dairy and stay away from alcohol during tournaments. Eat lots of avocados, cashew butter and very little sugar. Banish caffeine, other than the occasional energy gel bar before matches. Be sure to get seven to eight hours of sleep a night, meditate, do plenty of yoga and tai chi, take melatonin supplements, hook yourself up to a biofeedback machine that measures your stress level and, when you have a free moment or two, keep a diary. Feel free to unwind with a cup of warm licorice tea. In the book, Djokovic reveals one of his heretofore unknown obsessions: manuka honey from New Zealand. This expensive and tasty variety of honey comes from bees that feed on New Zealand's manuka trees—a dense-branched genus of shrub that can thrive in soil so depleted of nutrients that little else grows in it. "The first thing I do out of bed is to drink a tall glass of room-temperature water," Djokovic writes in "Serve to Win," which is scheduled for release by Zinc Ink, an imprint of Random House, on Aug. 20. "The second thing I do might really surprise you: I eat two spoonfuls of honey. Every day." He says he also eats it during matches. Dr. Peter Molan, a professor in biological sciences and a manuka honey expert at the University of Waikato in New Zealand, said the honey is known to have "exceptional" anti-bacterial properties, but that it's mostly used on infected wounds. He said he didn't think eating it would do a tennis player a lot of good. "A whole large jarful would get diluted too much by your system to be effective." Pro athletes—including many, many tennis players—are well known for their quirks and compulsions, both on the field and off. Djokovic doesn't have nearly as many of these as Rafael Nadal, whom Djokovic calls "a ball of nervous tics and superstitious rituals." Djokovic describes himself as more of a 26-year-old new-age wanderer. "The great gift of tennis has been the opportunity to travel," he writes. "It has allowed me to open my mind to what other cultures have to offer." In the book, Djokovic says he drinks mostly warm water because cold water slows digestion and "diverts blood away from where I want it—in my muscles." He reveals perhaps a bit too much about his ideal hydration level—"I like to have a bit of color in my urine"—and tells of his first encounter with chocolate after a year-and-a-half hiatus. He ate some after he beat Nadal in the 2012 Australian Open final, which lasted nearly six hours. Djokovic credits his transformation to Dr. Igor Cetojevic, a "skinny, grayhaired, mustachioed" Serbian nutritionist living in Cyprus. 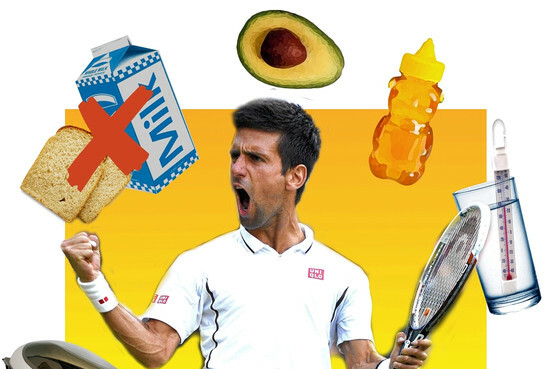 Dr. Cetojevic persuaded the tennis star to give up gluten by administering a simple test: He told Djokovic to put his left hand on his stomach, hold out his right arm and resist as the doctor pulled down on his arm. Then Dr. Cetojevic gave Djokovic a slice of bread and told him to hold that against his stomach and repeated the test. "This seemed like madness," Djokovic writes. "And yet, there was a noticeable difference." When an enzyme-linked immunosorbent assay (ELISA) test showed Djokovic had a strong intolerance to wheat and dairy, he went without gluten for 14 days and felt great. Then the doctor asked him to eat a bagel. "I felt as though I'd woken up with a hangover," he writes. Djokovic swore off gluten for good and ended up losing 11 pounds. He says he feels faster, more flexible and better able to concentrate. Since he started his new diet, he writes, "My allergies abated; my asthma disappeared; my fears and doubts were replaced by confidence." He adds: "I have not had a serious cold or flu in nearly three years." The book isn't all about diet and recipes. It's also part biographical: The Serbian-born Djokovic, who lost to Andy Murray in the Wimbledon singles final earlier this month, briefly recounts fleeing to a concrete bunker as a child when an F-117 bomber—"its great metal belly opened directly above me"—passed overhead during the NATO bombing of Belgrade. Djokovic also discusses his devotion to the teachings of Eastern medicine and philosophy. One of his favorite demonstrations, he says, involved a researcher and two glasses of water. The researcher shared positive energy with one glass ("love, joy, happiness"). He shared negative energy with the other and swore at it ("anger, fear, hostility"). After several days, the negative water was tinted green, and the positive water was still clear. "Sounds crazy, right?" Djokovic writes. "But to me, that test is proof that every single thing in the world shares the same kind of energy—people, animals, the elements, everything." One thing that's not in the book: any mention of his affinity for the CVAC pod, an airtight chamber that manipulates air pressure, temperature and density and is used by athletes to aid in their recovery. "What matters is not whether you believe in or follow these particular approaches," Djokovic writes. "What matters is that you are open minded." A version of this article appeared July 31, 2013, on page D6 in the U.S. edition of The Wall Street Journal, with the headline: Djokovic Opens the Refrigerator.